Perotinus Magnus (fl. 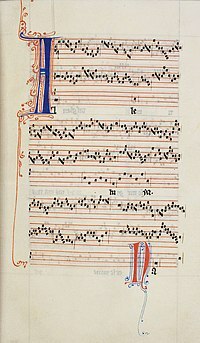 c. 1200), (Pérotin the Great, Magister Perotinus) was a composer from around the late 12th century, associated with the Notre Dame school of polyphony in Paris and the ars antiqua musical style. The title Magister Perotinus, means that he was licensed to teach. The only information on his life with any degree of certainty comes from an anonymous English student at Notre Dame known as Anonymous IV. It is assumed that he was French and named Pérotin, a diminutive of Peter, but attempts to match him with persons in other documents remain speculative. There have been many speculative attempts to identify Pérotin with members of the Notre Dame administration,[g] but these have not generally been accepted. Of the several people with that name (Petrus) that have been suggested, the commonest are Petrus Cantor (died 1197), a theologian and a Petrus, who was Succentor at Notre Dame ca. 1207–1238. Of these two, Petrus Succentor has been suggested as more probable, in part on chronological grounds, and partly because of the succentor's role in overseeing the celebration of the liturgy in the cathedral (whose choir was dedicated 1182), but this is purely speculative, resting on an assumption that the composer held some important rank in the cathedral hierarchy. Pérotin is considered to be the most important member of the Notre Dame school of polyphony, a group of composers working at or near the cathedral in Paris from about 1160 to 1250, creators of the ars antiqua style. The dates of Pérotin's life and works have long been a subject of debate, but are generally thought to be from about 1155/60 (or earlier) to around 1200/05 (or later), based on the evolution of French choral writing during this time (see Works), in particular, his apparent absence from the flowering of the French motet that occurred after 1210. Pérotin was one of very few composers of his day whose name has been preserved, and can be reliably attached to individual compositions, most of which have been transcribed. Anonymous IV called him Magister Perotinus (Pérotinus the Master). The title, employed also by Johannes de Garlandia, means that Perotinus, like Léonin, earned the degree magister artium, almost certainly in Paris, and that he was licensed to teach. However, only Anonymous IV employed the superlative Perotinus Magnus (Perotinus the Great). The name Perotinus, the Latin diminutive of Petrus, is assumed to be derived from the French name Pérotin, diminutive of Pierre. However "Petrus" was one of the most common names in the Ile de France during the High Middle Ages, making further identification difficult. The diminutive was presumably a mark of respect bestowed by his colleagues. The title Magnus was a mark of the esteem in which he was held, even long after his death. The reign of Louis VII (1137–1180) witnessed a period of cultural innovation, in which appeared the Notre Dame school of musical composition, and the contributions of Léonin, who prepared two-part choral settings (organa) for all the major liturgical festivals. This period in musical history has been described as a paradigm shift of lasting consequence in musical notation and rhythmic composition, with the development of the organum, clausula, conductus and motet. The innovative nature of the Notre Dame style stands in contrast to its predecessor, that of the Abbey of St Martial, Limoges, replacing the monodic (monophonic) Gregorian chant with polyphony (more than one voice singing at a time). This was the beginning of polyphonic European church music. Organum at its roots involves simple doubling (organum duplum or organum purum) of a chant at intervals of a fourth or fifth, above or below. This school also marked a transition from music that was essentially performance to a less ephemeral entity that was committed to parchment, preserved and transmitted to history. It is also the beginning of the idea of composers and compositions, the introduction of more than two voices and the treatment of vernacular texts. For the first time, rhythm became as important as pitch, to the extent that the music of this era came to be known as musica mensurabilis (music that can be measured). These developments and the notation that evolved laid the foundations of musical practice for centuries. The surviving manuscripts from the thirteenth century together with the contemporaneous treatises on musical theory constitute the musical era of ars antiqua. The Notre Dame repertory spread throughout Europe. In Paris polyphony was being performed in the late 1190s but later sources imply that some of the compositions date back as far as the 1160s. Although often linked to the construction of the cathedral itself, construction commenced in 1163 and the altar consecrated in 1182. However there was evidence of musical creativity there from the early twelfth century. Léonin's work was distinguished by two distinctive organum styles, purum and discantus. This early polyphonic organa was still firmly based on Gregorian chant, to which a second voice was added. The chant was called the tenor (cantus firmus or vox principalis), which literally “holds” (Latin: tenere) the melody. The tenor is based on an existing plainsong melody from the liturgical repertoire (such as the Alleluia, Verse or Gradual, from the Mass, or a Responsory or Benedicamus from the Office). This quotation of plainchant melody is a defining characteristic of thirteenth century musical genres. In organum purum the tenor part was drawn out into long pedal points, while the upper part or duplum contrasted with it in a much freer rhythm, consisting of melisms (melismatic or several notes per syllable, compared to syllabic, a single note per syllable). In the second, discantus, style, the tenor was allowed to be melismatic, and the notes were quicker and more regular with the upper part becoming equally rhythmic. These more rhythmic sections were known as clausulae (puncta). Another innovation was the standardization of note forms, and Léonin's new square notes were quickly adopted. Although he developed the discantus style, Léonin's strength was as a writer of organum purum. The singing of organa fell into disuse by the mid thirteenth century. Associated with the Notre Dame school, was Johannes de Garlandia, whose De mensurabili provided a theoretical basis, for Notre Dame polyphony is essentially musica mensurabilis, music that is measured in time. In his treatise, he defines three forms of polyphony, organum in speciali, copula, and discant, which are defined by the relationship of the voices to each other and by the rhythmic flow of each voice. Léonin compiled his compositions into a book, the Magnus liber organi (Great Organum Book), around 1160. Pérotin's works are preserved in this compilation of early polyphonic church music, which was in the collection of the cathedral of Notre Dame in Paris. [i] The Magnus liber also contains the work of his successors. In addition to two-part organa, this book contains three- and four-part compositions in four distinct forms: organa, clausulae, conducti and motets, and three distinct styles. In the organum style the upper voices are highly mobile over a tenor voice moving in long unmeasured notes. The discant style has the tenor moving in measured notes, but still more slowly than the upper voices. The third style has all voices moving note on note, and is largely limited to conductus. The surviving sources all commence with a four-voice organal setting of the Christmas Gradual, Viderunt omnes,[j] believed to be Pérotin's, as most likely did the original Liber. However, the manuscripts and fragments that survive[k] date well into the thirteenth century, meaning that they are preserved in a form notated by musicians working several generations following Léonin and Pérotin. This collection of music constitutes the earliest known record of polyphony to have the stability and circulation achieved earlier by monophonic Gregorian chant. Louis VII was succeeded by his son Philip II in 1179 and his reign was marked by integration and revision of the cultural shifts that had transpired under his father. It was during this time that the compositions of Pérotin first appeared, and a shift towards a more predominant discantus style. Pérotin is best known for his composition of both liturgical organa and non-liturgical conducti in which the voices move note on note. He pioneered the styles of organum triplum and organum quadruplum (three and four-part polyphony) and his Viderunt omnes and Sederunt principes,[l] Graduals for Christmas[m] and the feast of St Stephen's Day (December 26) respectively are among only a few organa quadrupla known, early polyphony having been restricted to two-part compositions. With the addition of further parts, the compositions became known as motets, the most important form of polyphony of the period. Pérotin's two Graduals for the Christmas season represent the highest point of his style, with a large scale tonal design in which the massive pedal points sustain the swings between consecutive harmonies, and an intricate interplay among the three upper voices. Pérotin also furthered the development of musical notation, moving it further from improvisation. Despite this, we know nothing of how these works came about. In addition to his own compositions, as noted by Anonymous IV, Pérotin set about revising the Magnus Liber Organi. Léonin's added duplum required skill, and had to be sung fast with up to 40 notes to one of the underlying chant, as a result of which the actual text progressed very slowly. Pérotin shortened these passages, while adding further voice parts to enrich the harmony. The degree to which he did this has been debated due to the phrase abbreviavit eundem by Anonymous IV. Usually translated as abbreviate, it has been surmised that he shortened the Magnus liber by replacing organum purum with discant clausulae or simply replacing existing clausulae with shorter ones. Some 154 clausulae have been attributed to Pérotin but many other clausulae are elaborate compositions that would actually expand the compositions in the Liber, and these stylistically resemble his known works which are on a much grander scale than those of his predecessor, and hence do not represent "abbreviation". An alternative rendering of abbreviavit is to write down, suggesting that he actually prepared a new edition using his better developed system of rhythmic notation, including mensural notation, as mentioned by Anonymous IV. Two styles emerged from the organum duplum, the "florid" and "discant" (discantus). The former was more typical of Léonin, the latter of Pérotin, though this indirect attribution has been challenged. Anonymous IV described Léonin as optimus organista (the best composer of organa) but Pérotin, who revised the former's Magnus Liber Organi (Great Organum Book), as optimus discantor referring to his discant composition., In the original discant organum duplum, the second voice follows the cantus firmus, note on note but at an interval, usually a fourth above. By contrast, in the florid organum, the upper or vox organilis voice wove shorter notes around the longer notes of the lower tenor chant. Anonymous IV mentions a number of compositions which he attributes to Pérotin, including the four-voice Viderunt omnes and Sederunt principes, and the three-voice Alleluia "Posui adiutorium" and Alleluia "Nativitas". Johannes de Garlandia states that the Magnus Liber commences with Perotin's four-part organa, and makes specific reference to the notation in the three-part Alleluya, Posui adiutorium. [n] Other works are attributed to him by later scholars, such as Heinrich Husmann, on stylistic grounds, all in the organum style, as well as the two-voice Dum sigillum summi Patris and the monophonic Beata viscera[o][p] in the conductus style. (The conductus sets a rhymed Latin poem called a sequence to a repeated melody, much like a contemporary hymn.) By tradition, the four-part pieces of the Notre Dame school have been attributed to Pérotin, leaving the two-part pieces to Léonin. The former include the three-part conductus Salvator hodie. The latter is placed in the Mass for the Circumcision in a 13th century French manuscript. Of these, the best known works are his Viderunt omnes and Sederunt principes. These have been described as representing the peak of musical development of the time. Most of Pérotin's works are in polyphonic form of discant, including the quadrupla and tripla. Here the upper voices move in discant, as rhythmic counterpoint above the sustained tenor notes. This is consistent with Anonymous IV's description of him as optimus discantor. However, like Léonin, he is likely to have composed in every musical genre and style known to Notre Dame polyphony. Pérotin's dates of activity have been approximated from some late 12th century edicts (Statuta et donationes piae) of the Bishop of Paris, Odo (Eudes de Sully)[q] (1196–1208), in 1198 and 1199. Rebuked by Pierre de Capuano, the papal legate of the time, the bishop sought to reform the rituals around the Christmas season, forbidding the boistrous costumed performances that existed at the time, in particular, the Feast of Fools. His preference was for elaborate music in its stead, calling for performance in organa triplo vel quadruplo for the Responsory and Benedicamus and other settings. [r] The bishop's edicts are quite specific, and suggest that Pérotin's organum quadruplum Viderunt omnes was written for Christmas 1198, and his other organum quadruplum Sederunt Principes was composed for Saint Stephen's Day 1199, for the dedication of a new wing of the Notre Dame Cathedral. [s] If written after this, they could not have been written till late 1200 or 1201, since for most of 1200 France lay under an interdict of Pope Innocent III which suppressed the celebration of church services. Hans Tischler dates the revision of the Magnus Liber to around 1180/90. Between the accounts of Anonymous IV, the episcopal edicts and the arrangements in the Magnus liber, the key compositions appear to be corroborated and assigned to this period. Pérotin composed music to at least five of the poems of the Chancellor of the cathedral, Philippe le Chancelier (Philip the Chancellor). Philip, also a canon there, held that title at the cathedral from 1218 till his death in 1236, suggesting a possible later date for Pérotin's setting of the former's Beata viscera (ca. 1220), or at least a terminus ante quem. Others believe this poem was written much earlier, and hence place Pérotin's death as no later than 1205, the bishop's edicts implying that Pérotin's work was well before this. [t] Philip appears to have written a number of poems with the intention of them being set to music by Pérotin,[u] and with him is given credit for the development of the motet. Anonymous IV identified seven works, that he presumably considered worthy of singling out, and these represent the only direct attribution. Subsequent authors have attributed works on stylistic and chronological grounds. These include Friedrich Ludwig (1910), Heinrich Husmann (1940), Hans Tischler (1950) and Ethel Thurston (1970). Husmann added an additional nine three-part organa, and five clausula to which Ludwig added numerous other clausula. Other authors have attributed all the 3 part organa in the Magnus Liber to Pérotin, which is unlikely. Nevertheless, two of the only three known 4 part organa can be attributed to him. Key: Anonymous IV (A), Johannes de Garlandia (G), Tischler (Ti), Thurston (Th), Husmann (H). Numbers refer to folios in the F manuscript of the Magnus liber. Pérotin has been described as the first modern composer in the Western tradition, radically transforming the work of his predecessors from a largely improvisatory technique to a distinct musical architecture. Pérotin's music has influenced modern minimalist composers such as Steve Reich, particularly in Reich's work Proverb. ^ Beata from Wolfenbüttel 1099 (W2) MS.
^ a b c d e f g h i j k l m n o p q Tischler 1950. ^ a b c d Tischler 1963. ^ a b c d e f g h i j k l m Roesner 2001. ^ a b Baltzer 2001. ^ a b Waite 1960. ^ a b c Wright 1989, 288. ^ Anonymous IV 1967, i:46. ^ a b c d Jenny 1942. ^ a b c d Vellard 1986. ^ a b Wright 1989, 294. ^ a b c d e Roesner 2018. ^ a b c Asensio 1997. ^ a b Sherr 2019. ^ a b c Johnson 2012, 24. ^ a b Tischler 1984. ^ a b c d Wallace 1993. ^ a b GB-Lbl Egerton 2615 2019. ^ a b Bradley 2018, 4. ^ a b c d e Perotin 1999. ^ a b c d Taruskin 2006, 243. ^ Latham 2011, Sederunt principes. ^ Latham 2011, Viderunt omnes. ^ a b c Hiley 2011. ^ Anonymous IV 1967, 1:46, 82. ^ a b Husmann 1940. ^ a b Perotin 1970. ^ a b Gross 2011. ^ a b Wright 1989, 289. ^ Wright 1989, pp. 288–289. Alwes, Chester L. (2015). A History of Western Choral Music. Oxford University Press. ISBN 978-0-19-045772-3. Berger, Anna Maria Busse (2005). Medieval Music and the Art of Memory. University of California Press. ISBN 978-0-520-93064-3. Bradley, Catherine A. (2018). Polyphony in Medieval Paris: The Art of Composing with Plainchant. Cambridge University Press. ISBN 978-1-108-41858-4. Burrows, John (2012). The Complete Classical Music Guide. DK Publishing. ISBN 978-1-4654-0134-2. Clarke, Peter D. (2007). The Interdict in the Thirteenth Century: A Question of Collective Guilt. OUP Oxford. ISBN 978-0-19-920860-9. Duffin, Ross W., ed. (2000). A Performer's Guide to Medieval Music. Indiana University Press. ISBN 0-253-21533-1. Everist, Mark; Kelly, Thomas Forrest, eds. (2018). The Cambridge History of Medieval Music. Cambridge University Press. ISBN 978-1-108-57707-6. Finscher, Ludwig; Mahling, Christoph-Hellmut, eds. (1967). Festschrift für Walter Wiora zum 30. Dezember 1966. Kassel: Bärenreiter. Flotzinger, Rudolf (2000). Perotinus Musicus: Wegbereiter abendländischen Komponierens (in German). Mainz: Schott. ISBN 978-3-7957-0431-5. — (2007). Von Léonin zu Pérotin: der musikalische Paradigmenwechel in Paris um 1210 (in German). Peter Lang. ISBN 978-3-03910-987-6. Gattermayer, Elena Bonoldi (2006). Bianca di Castiglia: regina di Francia e madre di un santo (in Italian). Milan: Editoriale Jaca Book. ISBN 978-88-16-40727-5. Hayburn, Robert F. (1979). Papal legislation on sacred music, 95 A.D. to 1977 A.D. Collegeville: Liturgical Press. ISBN 978-0-8146-1012-1. Husmann, Heinrich (1940). Die Drei-und vierstimmigen Notre-Dame-Organa: Kritische gesamtausgabe (in German). Leipzig: G. Olms. Johnson, Julian (2012). Classical Music: A Beginner's Guide. Oneworld Publications. ISBN 978-1-78074-141-3. Kelly, Thomas Forrest, ed. (1992). Plainsong in the Age of Polyphony. Cambridge University Press. ISBN 978-0-521-40160-9. Kirkman, Andrew (2010). The Cultural Life of the Early Polyphonic Mass: Medieval Context to Modern Revival. Cambridge University Press. ISBN 978-0-521-11412-7. Ludwig, Friedrich (1978). Repertorium organorum recentioris et motetorum vetustissimi stili (in German). Assen: Institute of Mediaeval Music. Marien, Evelyn; Heinen, Andreas, eds. (2002). Musikwissenschaft im Phonomarkt: Alte Musik und CD-Produktion [Musicology in the Phonomarket: Early Music and CD Production]. Wilhelmshaven: Florian Noetzel Verlag. ISBN 978-3-7959-0809-6. Page, Christopher (1990). The Owl and the Nightingale: Musical Life and Ideas in France 1100-1300. University of California Press. ISBN 978-0-520-06944-2. Parrish, Carl; Ohl, John F. (2013). Masterpieces of Music Before 1750. Courier Corporation. ISBN 978-0-486-14310-1. Perotin (1970). Thurston, Ethel (ed.). The works of Perotin. Edwin F. Kalmus. Anderson, Gordon A. (April 1972). "The Works of Perotin by Ethel Thurston". Music & Letters (Review). 53 (2): 224–230. JSTOR 733642. Perotin (1999). Viderunt omnes, Sederunt (Miniature Score). Kalmus. ISBN 978-1-4574-6877-3. Roesner, Edward H., ed. (2009). Ars antiqua: Organum, Conductus, Motet. Taylor & Francis. ISBN 978-1-351-57583-6. Taruskin, Richard (2006). Music from the Earliest Notations to the Sixteenth Century: The Oxford History of Western Music Vol. 1. Oxford University Press. ISBN 978-0-19-979604-5. Wilson-Dickson, Andrew (2003). The Story of Christian Music: From Gregorian Chant to Black Gospel. An Authoritative Illustrated Guide to All the Major Traditions of Music for Worship. Fortress Press. ISBN 978-0-8006-3474-2. Wright, Craig (1989). Music and Ceremony at Notre Dame of Paris, 500-1550. CUP Archive. ISBN 978-0-521-24492-3. Garlandia, Johannes de (1994) [c. 1240]. Hayes, Stephen E.; et al. (eds.). De Mensurabili Musica positio (in Latin). University of Indiana. Migne, Jacques-Paul, ed. (1855). Patrologiae latina cursus completus ... series secunda (in Latin). Aqud Editorem. "Perotin". Encyclopedia of World Biography. Gale Group. 2004. Retrieved 14 January 2019. Encyclopaedia Britannica (2016). Pérotin. Retrieved 15 January 2019. Emmerson, Richard K., ed. (2013). Key Figures in Medieval Europe: An Encyclopedia. Routledge. ISBN 978-1-136-77519-2. Kibler, William W.; Zinn, Grover A., eds. (1995). Medieval France: An Encyclopedia. Psychology Press. ISBN 978-0-8240-4444-2. Vauchez, André, ed. (2000). Encyclopedia of the Middle Ages: 2 vols. Fitzroy Dearborn Publishers, Incorporated. Asensio, Juan Carlos (February 1997). "Before Quasimodo: Very Early Polyphony". Early Music (Review). 25 (1): 145–147. JSTOR 3128176. Baltzer, Rebecca A. (July 1987). "Notre Dame Manuscripts and Their Owners: Lost and Found". The Journal of Musicology. 5 (3): 380–399. doi:10.2307/763698. JSTOR 63698. Berger, Anna Maria Busse (July 1996). "Mnemotechnics and Notre Dame Polyphony". The Journal of Musicology. 14 (3): 263–298. doi:10.2307/764059. Fassler, Margot E. (April 1987). "The Role of the Parisian Sequence in the Evolution of Notre-Dame Polyphony". Speculum. 62 (2): 345–374. doi:10.2307/2855230. JSTOR 2855230. Gastoué, Amédée (April 1917). trans. H. Morette. "Three Centuries of French Mediæval Music: New Conclusions and Some Notes". The Musical Quarterly. 3 (2): 173–188. JSTOR 738083. Haines, John (2006). "Anonymous IV as an Informant on the Craft of Music Writing". Journal of Musicology. 23 (3): 375–425. doi:10.1525/jm.2006.23.3.375. ISSN 0277-9269. JSTOR jm.2006.23.3.375. Gross, Guillaume (2001). "La repetitio dans les organa quadruples de Pérotin: Nature rhétorique de l'organisation du discours musica". Musurgia. 8 (1): 7–29. JSTOR 40591215. — (2011). "L'organum aux xiie et xiiie siècles: le discours musical comme stratégie de communication ou la légitimation implicite de l'autorité épiscopale" [The Organum in the Twelfth and Thirteenth Centuries: Musical Discourse as Communication Strategy or the Implicit Legitimating of Episcopal Authority]. Revue historique (in French). 659 (3): 487–510. doi:10.3917/rhis.113.0487. Heerings, Arnoud (2005). "Perotinus". Gregoriusblad: Tijdschrift tot Bevordering van Liturgische Muziek. 129 (1): 53–57. Jenny, Herbert J. (August 1942). "Perotin's "Viderunt omnes"". Bulletin of the American Musicological Society (6): 20–21. doi:10.2307/829204. Tischler, Hans (January 1950). "New Historical Aspects of the Parisian Organa". Speculum. 25 (1): 21–35. doi:10.2307/2850001. — (July 1963). "The Dates of Perotin". Journal of the American Musicological Society. 16 (2): 240–241. doi:10.2307/829944. JSTOR 29944. — (1984). "New data on the evolution of the Parisian organa". Journal of Musicological Research. 5 (1–3): 85–91. doi:10.1080/01411898408574546. — (Spring 1984a). "The Evolution of the "Magnus Liber Organi"". The Musical Quarterly. 70 (2): 163–174. JSTOR 742208. Waite, William G. (April 1960). "Johannes de Garlandia, Poet and Musician". Speculum. 35 (2): 179–195. doi:10.2307/2851338. Wallace, Robin (January 1993). "The role of style in the Notre‐Dame period: A preliminary study". Journal of Musicological Research. 12 (4): 253–271. doi:10.1080/01411899308574670. Hillier, Paul (1989). "Perotin". program notes to The Hilliard Ensemble: Perotin. CD ECM New Series 1385 (837-751-2). Munich: ECM Records. Vellard, Dominique (1986). Ecole de Notre-Dame de Paris 1163–1245: Monodies et polyphones vocales (Liner notes) (CD). Paris: Harmonic Classics. HCD8611. Retrieved 15 January 2019. Lewis, Andrew (21 February 2018). "Reich's Proverb In Dialogue with Medieval Masters". Bella Voce. School of Theatre & Music, University of Illinois, Chicago. Retrieved 9 February 2019. McComb, Todd M. (2019). "Perotin (fl.c.1200) – A discography". Medieval Music & Arts Foundation. Retrieved 16 January 2019. Reich, Steve (2019). "Steve Reich. Proverb (1995)". Composers. Boosey and Hawkes. Retrieved 20 January 2019. Sherr, Richard. "Early Polyphony: Some Defintions". Department of Music, Smith College. Retrieved 16 January 2019. "Medieval music and memory". (RILM) Répertoire International de Littérature Musicale: Bibliolore. RILM. City University of New York. 21 July 2016. Retrieved 29 January 2019. Daolmi, Davide. "Storia della musica medioevale e rinascimentale". Temporum Stirpis Musica. Dipartimento di Beni culturali e ambientali, Università degli Studi di Milano. Retrieved 18 February 2019. Garlandia, Johannes de. "De mensurabili musica". "Pérotin". IMSLP. Retrieved 12 February 2019. "Pérotin". Choral Public Domain Library. 30 September 2017. Retrieved 12 February 2019. Chanticleer (1991). Psallite! A Renaissance Christmas (CD) (in Latin). Messe de la Nativité de la Vierge. Ensemble Organum, Marcel Pérès. Harmonia Mundi 901538 (1995). Wikimedia Commons has media related to Notre Dame school. This page was last edited on 4 April 2019, at 07:46 (UTC).